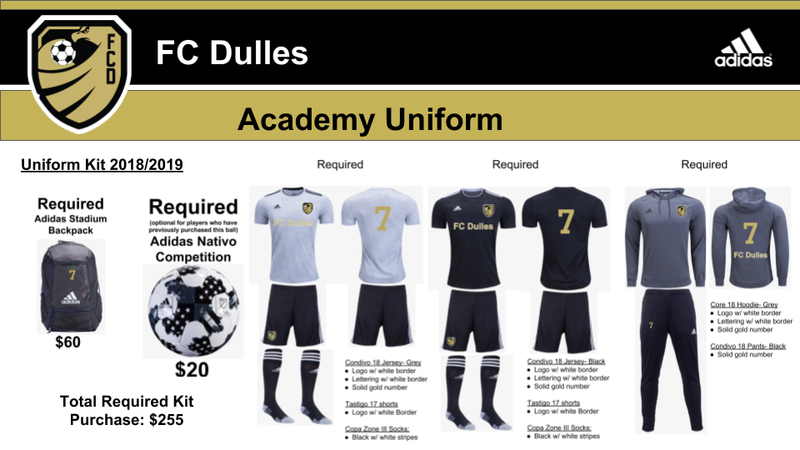 FC Dulles Academy Fall 2018 Golazos! Club weekday training- 2x/wk., 20 sessions Fall; 20 sessions Spring. Four tournament (extra expenses may incur for away tournaments). League games (Fall & Spriing): League and competition level to be determined by Technical Director. Coach's Salary based on coach's USSF license and experience. FC Dulles Winter Indoor Futsal League- 7 to 8 games. Winter indoor training 7-8 sessions. Winter outdoor training (if weather permits- club's discretion). Club dues- administrative and field maintenance. Team preseason minicamp- 4 days in August, 9-11:30 AM. Weekly Free Play- Typically Friday nights in the Fall & Spring seasons. Team video Analysis- Game & training session analysis w/ FC Dulles Technical Staff. Installment Plan #1: Deposit (10%) followed by 9 additional months. Installment Plan #2: Deposit (20%) followed by 4 additional months. A $2/month service ee will be assessed to all installment plans.